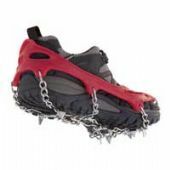 Most walking crampons are not actually designed to fit onto average walking boots. They are made to fit the top end performance walking boots with soles that have a significant degree of stiffness, known as B1 boots. Kahtoola Microspikes are a new breed. Because they have small spikes and fasten with an elastic rand they can fit on very flexible boots, even onto running shoes. The hiking poles shown here are especially popular. 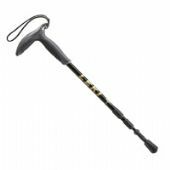 The Leki Super Micro bacause it packs so small to fit in luggage, the Rohan Ether Pole is the lightst alloy pole made and the Trailwise Rambler is made from aircraft grade alloy at a really keen price.